"Human Trafficking and Judicial "Divination" in Hong Kong"
Abstract: The Court of Appeal’s (CA) recent ruling in ZN v Secretary for Justice on human trafficking is problematic for three reasons. First, it read too much into the People’s Republic of China’s choice not to apply the Palermo Protocol to Hong Kong. Second, the CA’s striking preference for the United Nations Human Rights Committee’s General Comments over the European Court of Human Rights jurisprudence contradicts a long line of the Court of Final Appeal case law. 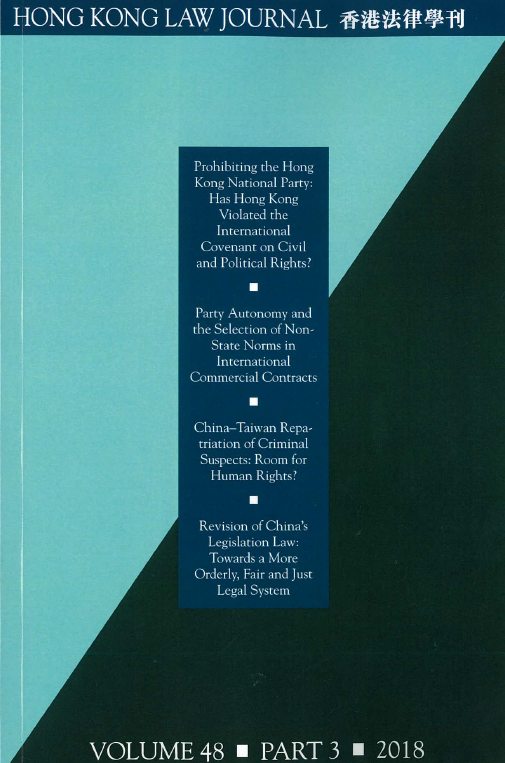 Finally, the CA’s ruling that the errant employer’s abusive conduct towards ZN constituted forced labour, in contravention of art 4(3) of the Hong Kong Bill of Rights, is extraordinary because s 7 of the Hong Kong Bill of Rights Ordinance (Cap 383) (BORO) explicitly provides that the BORO does not apply to conduct between private individuals. While deeming it unnecessary for the Hong Kong legislature to enact a specific law on forced labour, the CA ironically established a new common law offence of forced labour under Hong Kong law.